The Consolidated B-24 Liberator is a four-engine heavy bomber aircraft produced by the US-American manufacturer Consolidated Aircraft Corporation. The B-24 Liberator was also produced by Douglas Aircraft Company, North American Aviation and Ford Motor Company. 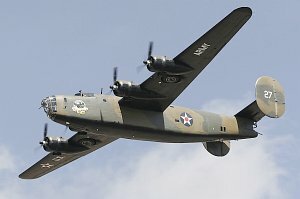 Nearly half of the B-24 production was performed by Ford.